Marcia Robinson shares memories, including a publicity still, from her days as the first African American to be hired to dance as a Sahara Girl at the Sahara Hotel. WEST LAS VEGAS, Nevada — Marcia R. Robinson is always near and is dear in the hearts of many in this community that shares the same history as Las Vegas and in that same history has parallel and current experiences. To say and identify West Las Vegas is the same as extolling the dynamics of place, people, time and currency. West Las Vegas means predominantly African American and Historic West Las Vegas includes the times when people who otherwise worked together — some in restricted positions — and sent their children to school together lived apart under the rule of segregation. Such a rule remains tantamount in telling the story of the American experience of this community which still recalls the icons who used to frequent the social scene here and overnight places to stay. In those days, especially during the short-lived existence of the Moulin Rouge, Sammy Davis Jr. and Rat Pack friends like Frank Sinatra and Peter Lawford could be found after hours in West Las Vegas entertaining and being entertained. This part of the city also has an everlasting affinity for Pearl Bailey, Ella Fitzgerald and Nat King Cole, among others. That show opened at the MGM Grand Hotel on the big stage in the Ziegfield Room in April 1974. Robinson had graduated from the University of California, San Diego and then earned a Master of Fine Arts from the University of San Diego before coming here to play here craft. She grew up in East St. Louis, Illinois, where she learned dance under the tutelage of Katherine Dunham, anthropologist, dancer, choreographer and social activist, at Dunham’s Performing Arts Training Center on the branch campus of Southern Illinois University in East St. Louis. Indeed, Dunham, viewing the dance scene on YouTube from the 1943 film “Stormy Weather,” gives a glimpse of the power of dance in the eye of the beholder. Dunham had earned a Bachelor of Arts from the University of Chicago and later received a Master’s Degree from Northwestern University. She studied African dance in the Caribbean for two years as a budding anthropologist and African dance influences would be the hallmark of a long and distinguished career. “Katherine Dunham is my mentor,” Robinson says of the choreographer and dancer who passed away on May 21, 2006 — about a month shy of her 97th birthday. “Everybody who goes through this life needs a mentor. When I met her, I was young, didn’t have a focus, living in East St. Louis. I thought that place was the world. When you survey the life of Dunham, Robinson’s life of commitment to dance, academics and activism in the community parallels that of her mentor and dance instructor. Hence forward, in this story about her, if Robinson is bringing to fruition an idea, she is more than likely channeling Katherine Dunham. Examining separate photos of Dunham and Robinson, there are striking similarities between the two in appearance. At this point, the interviewer pores through Robinson’s photo albums and publicity stills that capture a life of black firsts during her days dancing on the Las Vegas Strip. Robinson was hired to be a Sahara Girl at the Sahara Hotel. That was the year, she remembers, November 1980, the MGM Grand caught fire and 85 people lost their lives. As an aside, for two different stints in a nomadic life, residence was taken up here in the valley. The job as community relations coordinator at the book superstore provided contact with and the chance to work with many people in various pursuits in life. The bookstore was a community gathering place. A key part of the marketing strategy was to provide meeting or performance space free of charge to groups or individuals who in turn would become valued customers. That was back in 1997, when friends for life began with Marcia Robinson. Truth be told, Marcia Robinson declines most interviewer requests. However, for “On the Road: People Bridges to People,” the first nationwide project of America, The Diversity Place, she reluctantly sat for an interview and braved a photo shoot. One of the organizations that we at the bookstore developed a strong working relationship with in the community was the West Las Vegas Arts Center. Hired by the city in November 1994, Robinson has been director at the arts center since it opened on January 13, 1995. It is a major role in a life that emulates Katherine Dunham. “The elders of the community came together and said something needed to be done to help our young people,” Robinson says. “They put together a list of what was needed in the community and a cultural arts center was at the top of that list. I was fortunate to be the one appointed to lead the center. The West Las Vegas Arts Center began offering classes to kids five years and up and began with an African dance class, ala Katherine Dunham, for seniors. Robinson taught youth classes until a full roster of dance instructors was recruited. “What we concentrate on is our youth development,” Robinson says. “The Westside historically has had high youth unemployment rates. There was a lot of discontentment. People here thought there was a lack of municipal government support and improvements were also needed in the education system. The area had high crime rates and was experiencing gang activity. The Performing and Visual Arts Summer Camp for Kids began in 1996, starting each morning at 7:30 and wrapping up by 5 p.m. $40,000 in jail fees that were designated to underserved communities covered costs of operating the camp that first summer. Among dance and theater activities, students learned sounds of a steel drum ensemble — a staple of Caribbean music and another testament to Katherine Dunham’s influence. In recent years, the end of summer camp production was performed on stage at the House of Blues in the Mandalay Bay Resort and Casino. Yearly, Kwanzaa and the seven African harvest and community principles developed by Dr. Maulana Karenga are celebrated here at the West Las Vegas Arts Center. Over the years, the walls of the arts center have provided exhibit space for talented artists. Ongoing rites of passage programs are held separately for boys and girls. Motivation programs that include conflict resolution have evolved as unique offerings at the arts center. “Most of the kids will say ‘I have had a great morning. I am ready to work.’ And they will name for themselves the area they want to work on themselves. We give them autonomy to be their best selves. Our mission is to bring out the best in you so that you know you are being your best. What future programming would Robinson, who in recent years earned a doctorate in education degree from the University of Nevada, Las Vegas, like to see for the community? “It would have to be intergenerational,” she says. “It has to have the elders, but it has to have the young people, too. We all leave this earth. Elders have to give back. Our youth go through different stages of life. They will become the elders and will have to give back. Everybody has to be part of the process. We have a responsibility to each other. 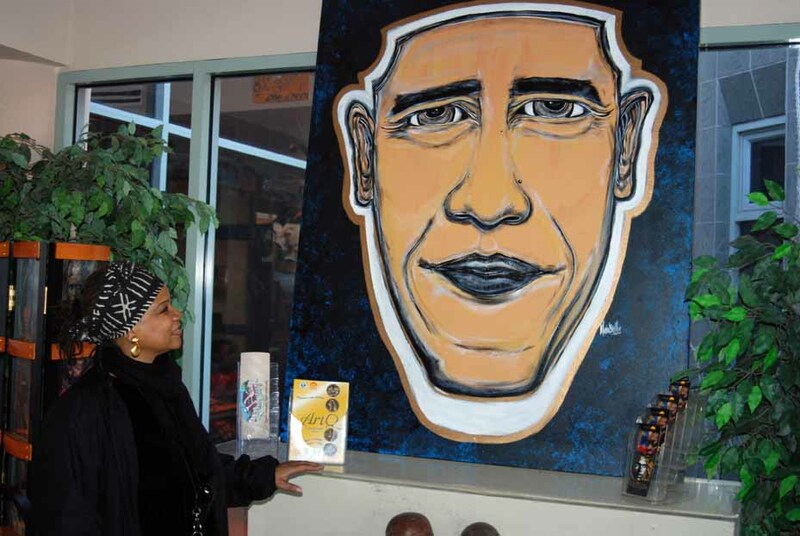 Mario Lorne Smith Jr., a Bahamian and Dutch artist, also known as “MINX,” created facial painting of President Obama on display at the West Las Vegas Arts Center.